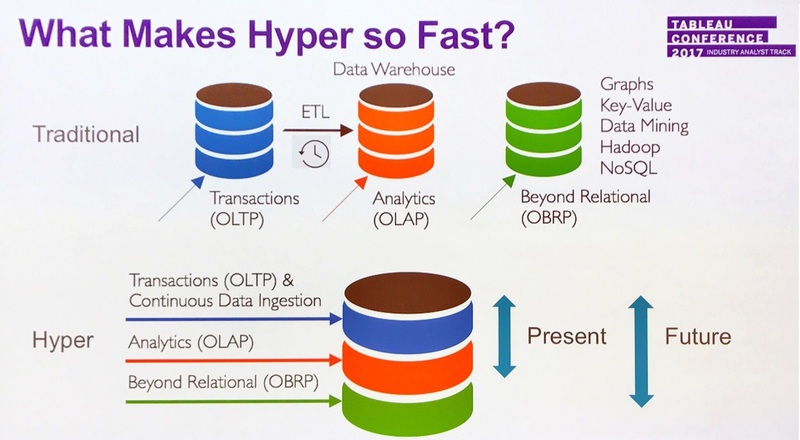 The Future of Enterprise Analytics: Hyper can handle both OLTP and OLAP simultaneously. In the future it will address NoSQL and graph workloads. 1. What is Hyper’s key benefit? Hyper is a Hybrid transactional/analytical processing (HTAP) database system and replaces Tableau Data Extracts (TDE). The change will be mostly transparent for end users, other than everything being faster. Hyper significantly improves extract refresh times, query times and overall performance. 2. What is Hybrid transactional/analytical processing? Hybrid transaction/analytical processing (HTAP) is an emerging application architecture that “breaks the wall” between transaction processing and analytics. It enables more informed and “in business real time” decision making. The two areas of online transaction processing (OLTP) and online analytical processing (OLAP) present different challenges for database architectures. Currently, customers with high rates of mission-critical transactions have split their data into two separate systems, one database for OLTP and one so-called data warehouse for OLAP. While allowing for decent transaction rates, this separation has many disadvantages including data freshness issues due to the delay caused by only periodically initiating the Extract Transform Load (ETL) data staging and excessive resource consumption due to maintaining two separate information systems. 3. Does Hyper satisfy the ACID properties? Hyper, initially developed at the Technical University of Munich and acquired by Tableau in 2016, can handle both OLTP and OLAP simultaneously. Hyper possesses the rare quality of being able to handle data updates and insertions at the same time as queries by using hardware-assisted replication mechanisms to maintain consistent snapshots of the transactional data. Hyper is an in-memory database that guarantees the ACID properties (Atomicity, Consistency, Isolation, Durability) of OLTP transactions and executes OLAP query sessions (multiple queries) on the same, arbitrarily current and consistent snapshot. 4. What makes Hyper so fast? The utilization of the processor-inherent support for virtual memory management (address translation, caching, copy on update) yields both at the same time: unprecedentedly high transaction rates as high as 100,000 per second and very fast OLAP query response times on a single system executing both workloads in parallel. This would support real-time streaming of data in future releases of Tableau. These performance increases come from the nature of the Hyper data structures, but also from smart use of contemporary hardware technology, and particularly nvRam memory. Additional cores provide a linear increment in performance. 5. What does this mean for Tableau? With Hyper now powering the Tableau platform, your organization will see faster extract creation and better query performance for large data sets. Since Hyper is designed to handle exceptionally large data sets, you can choose to extract your data based on what you need, not data volume limitations. Hyper improves performance for common computationally-intensive queries, like count distinct, calculated fields, and text field manipulations. This performance boost will improve your entire Enterprise Analytics workflow. Join our “The Future of Enterprise Analytics” events and get a sneak peak at upcoming features and the Tableau Roadmap: 14th of November in Düsseldorf and 6th of December in Frankfurt. [Update 20 Dec 2017] Hyper Kickoff Event: Join us for the Hyper Kickoff Event at the 18th of January 2018 in Tableau’s Frankfurt Office.